we spend the weekend at home reorganizing a few different areas of our house. 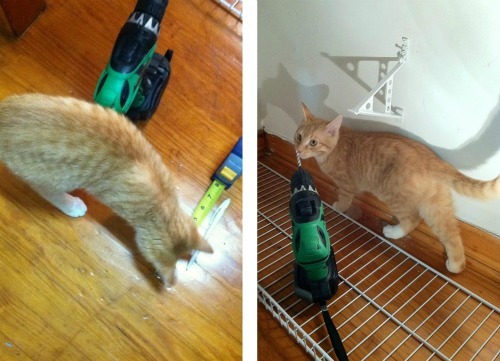 we actually had fun doing it (and we had a furry little assistant that had fun helping us too). there's nothing like newly arranged closets and cabinets to make you feel nice and organized! 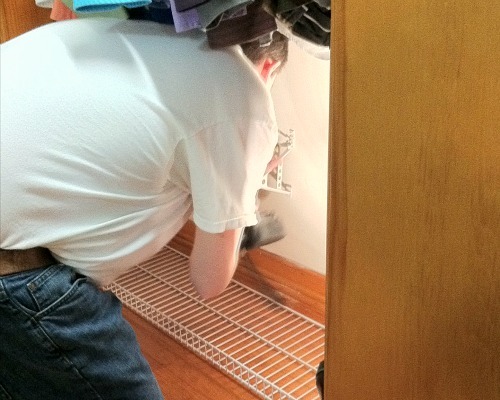 it all started on saturday morning when we woke up and got the idea to tackle the bottom of the closet in our bedroom. since our house was built in the 1940s, the closets in the bedrooms are very basic, and our shoes just sat on the floor of the closet in our bedroom. 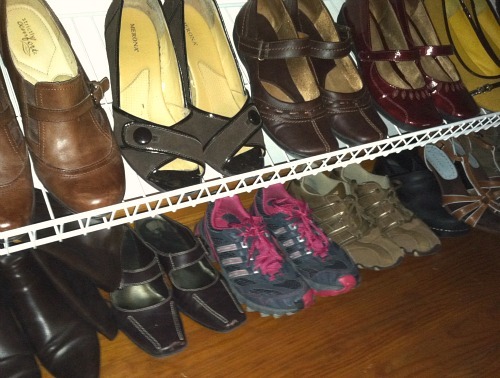 so, we took a trip to lowe's and bought closet organizer shelves to make shoe racks. 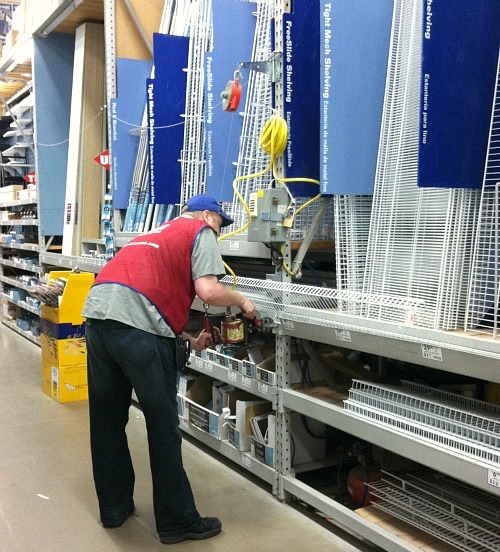 the friendly people at lowe's even custom cut the shelves for us. we were so thrilled with this simple yet functional change to the closet in our bedroom that we moved downstairs to our kitchen on sunday morning and reorganized our small appliance, and then all of our dishes, glasses, coffee cups, and travel mugs. 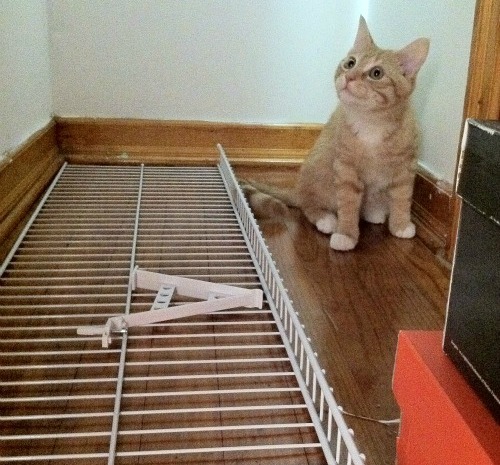 it turns out that organizing things is addictive. once we got started, we were on a roll. we are really pleased with the outcome of our weekend reorganization project, and now we are looking around the house to see what we can tackle next! 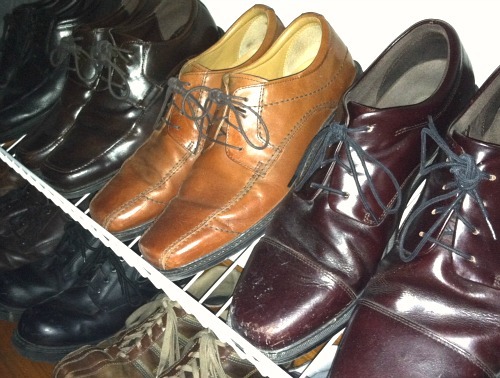 here are a few pictures from our shoe reorganization project. it's amazing how such a simple change can make your daily routine so much easier! seriously organizing is my most favorite thing to do. the closet looks great! I so need help organizing my whole house. Now that Matthew's bday is over, we need to buckle down and start operation decluttering! !